I’m not a fan of most R&B/hiphop music, and I don’t even particularly like this song, but I couldn’t stop it from going through my head as I was doing the research for this page. It’s probably true that as a schoolkid, if I’d had a beautiful big Eastern Milk Snake like this it would’ve attracted a lot of attention. I spotted it basking on the road earlier this week. There wasn’t any sun, but the road pavement would still have picked up enough of the radiation that did manage to pierce the clouds to be just a bit warmer than the surrounding vegetation. Concerned for his longevity should he continue to stay there, I got out of my car, ran a few photos off, and then shooed him back into the nearby ditch with the help of a longish stick. Strictly speaking, the milk snakes, while they can give a painful bite, are not dangerous in the sense of being lethally venomous, so the stick was mostly to ensure my skin remained intact. It doesn’t use venom to subdue its prey, but instead catches it with its teeth and then constricts it to kill it. It is primarily a nocturnal hunter, and tends to be hidden during the day, under or behind objects. As adults their diet mostly consists of small rodents such as mice, but they’re opportunistic feeders, eating anything it can catch that’s small enough to fit down its throat, from birds’ eggs to frogs to invertebrates. 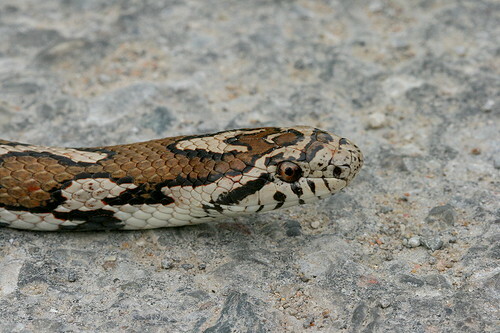 A young milk snake will mostly eat invertebrates befitting its much smaller size. 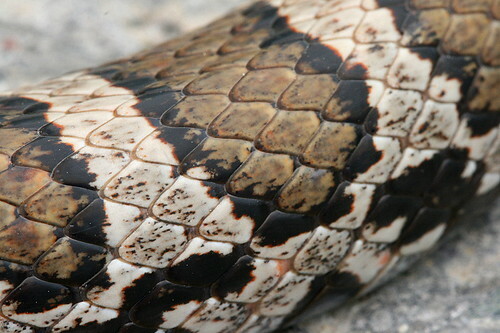 The Eastern Milk Snake is actually a subspecies of the Milk Snake, Lampropeltis triangulum. The Eastern is the nominate subspecies, L. t. triangulum. There are 25 recognized subspecies of Milk Snake, ranging from southeastern Canada south to Ecuador and Venezuela in South America. In North America the Eastern has perhaps one of the largest ranges of the milk snakes that are native to here, found in deciduous forests from Quebec and Maine, west to eastern Minnesota, and south to northern Alabama. Different subspecies will achieve different lengths, ranging from 50 to 150 cm (20 to 60 inches). This one was on the smaller side of that range, perhaps a couple of feet. Some of the other subspecies are known as kingsnakes, and/or resemble the highly venomous coral snakes. It’s surprising to think that the above snake is actually related to the one that we find around here. In fact, some of the milk snake subspecies may eventually be split off into their own distinct species, but for the time being they’re all one group. In the south, the venomous coral snakes can be told from the non-venomous milk snakes by a rhyme that goes, variously, something like, “red beside black, you’re okay Jack, red beside yellow, you’re a dead fellow.” If you look closely at the Eastern Milk Snake you can begin to see how the blotches may have started out as bands (or vice versa). If disturbed, the Eastern Milk Snake will sometimes rear back and rapidly vibrate its tail in the ground litter. 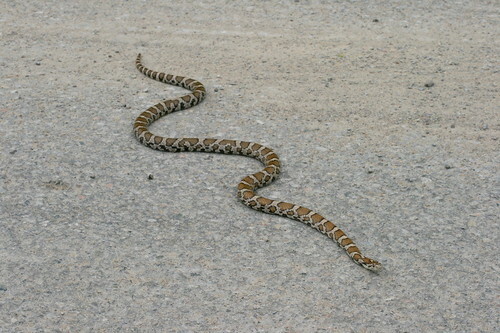 This can sound a little like a rattle and with the brown spots along the back the species can sometimes be confused for a rattlesnake – obviously to its advantage since nearly everything will back away from the threat of a rattlesnake. The individual I came across was either too cool still to be active, or completely unconcerned about any threat I posed. I was able to get quite close (slowly, cautiously) with the macro lens on the camera, and it just sat there until I pushed it gently with the stick to encourage it to move. 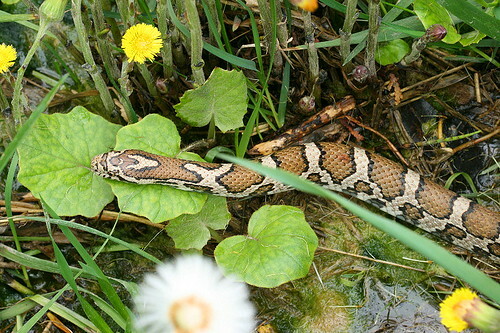 The Eastern Milk Snake resembles a couple other species found in the east. 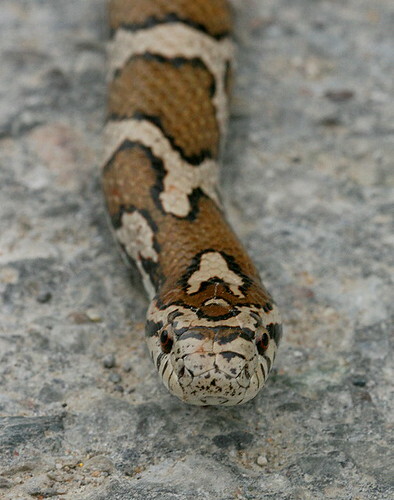 Both the Fox Snake and the Copperhead have similar blotchy patterns, but the milk snake is more slender, and has a distinctive pale Y or V just behind the head. Since coral snakes don’t occur this far north, it’s likely that the milk snakes of this region have evolved to resemble the venomous snakes that do, both in behaviour and appearance. This is called Batesian mimicry, when one non-venomous/poisonous species evolves a visual appearance that resembles another species which is, such that the non-venomous species benefits from predators’ experience with the real ones. The same thing is seen with the Viceroy butterfly, where they superficially resemble Monarchs through the north, and Queens through the south, according to the unpalatable species in the region. The name Milk Snake may have come from the species’ habit of frequenting barns and barnyards, where there are plentiful rodents and cool, dark interioris. A myth arose from this association that it would suckle cow teats for the milk. The myth is false, but the name seems to have stuck. Milk Snakes lay eggs to reproduce. They mate in early May to late June and lay the eggs in June or July in sheltered spots such as beneath logs or rocks. The clutch of about 10 eggs, on average, hatch after about two months, in late summer. Like with most species, the first year of life is the most dangerous and the youngsters run the highest risk of death while they learn the ways of the world, but once they’ve made it through that first year they can potentially live as long as 12 years. In Ontario and Canada the Eastern Milk Snake is a species of special concern, and it may be partially due to persecution, run-ins with cars, and other human-related causes of death. However it’s apparently also a popular snake in the pet trade (probably more so the brightly-coloured subspecies of the south). To try to avoid this individual from becoming another casualty, I coaxed it over to the nearby ditch where it slowly slithered into the grass. When I peered over the edge to where it was sitting, its defensive response finally kicked in, and it coiled up its front part to show me it wasn’t afraid to strike if I got too close. I respected its privacy now that it was in a safer spot and returned to my car. Safe travels, buddy. Better you than me, girl…I don’t like snakes!! But, great facts on them and incredible shots. im not sure where u heard milk snakes give a nasty bite as for one they do not have any teeth and second…they are more dosile than a garder snake!! !…Ive had two that we caught at our cottage & allowed my children to keep them as pets for the few days we were there!…Im not a snake person myself either,but finally got the courage to hold it when my friend that is the manager for reptilia told me they DONT have teeth and are the friendliest off all ontario snakes!! !I always thought garder snakes had no teeth & did not bite,but he informed me that they DO have teeth & they can actually draw blood if they feel threatened! They certainly do have teeth! I know cuz I have been bitten by a milk snake, drew blood! I had 2 of them that I had removed from my yard so they wouldnt be injured while we were revamping it. I love snakes and these 2 were paired. One was particularly defensive while the other was more docile. One of my neighbors went to touch one as I was handling them and he got bit which in turn got me bit. They have sharp teeth two fangs and the side teeth are serated backwards in a line, probably to hold their prey while constricting them. Yes, they do have teeth. I do not consider it a nasty bite per say, it is more startling then painful. They are tiny little razor sharp hooks to hold onto their prey. They do draw blood, trust me! In fact I believe the only snakes without teeth are egg eating snakes. I could be wrong but they are the only species I have heard of. I would call Reptilia and tell them to stop spreading misinformation if I were you. i love the title of the post!! Snakes doing hip-hop? I realize it’s not my era, but… wouldn’t they need legs? Oh my god… I LOVE milk snakes! I think they are soooo pretty. Beautiful pictures! Great photos, and they were a great help, about an hour ago my husband got bit by one of these (we’re in north-western Illinois). We were at the fire pit and he had just grabbed two logs from the log pile and then suddenly had these two little fang marks on his ankle. I managed to get a partial photo of the snake before it got back undersground. That tail rattling against the leaves and his aggression had us a little worried for a while there. Thanks for dropping by, Marcia, hope the snake’s in a safer spot now! I always love it when I think I’m so very clever and then google shows me that a lot of people had the same genius idea way ahead of me. Sad. Although I think all snakes are fascinating and appealing, the milksnake has to be one of the prettiest snakes I have ever encountered in my home state, Wisconsin. To see one soon after a molt with it’s beautiful pattern looking especially colorful and shiny, is a wondrous thing. It’s a shame so many people are terrified of these lovely creatures. So it seems that I have a milk snake in my house! I went to close the living room window on Sunday and low and behold, a milk snake was sitting on theh window sill. I’m not overly fond of snakes and know little to nothing about them, so am trying to do some research… any ideas on how to get it OUT of the house? If you leave the window open, there’s a good chance it’ll leave on its own. If it doesn’t, try gently nudging it with a broom handle in the direction you’d like it to go. And if that still doesn’t work, you can probably slip the broom handle under its body and carefully carry it out. i was wondering what was directing people to my blog, in particular a post about an eastern milksnake, and i found your site – very nice. These are something else, these snakes, we live in the same region as you appear to, and have several on our property. Great post & info. Thanks. it doesnt matter how small this snake may be it will not eat insects.Your meal may be its first,believe it or not,go to your local pet store ‘get the smallest pinkie mice that they have’.Take ur smallest and poke a small hole in its 4head’ that is called braining’so that the snake can track it.OH–most important make sure ur mouse is frozen at first soak it in hot water for 20 minutes in a sandw. bag(it should be frozen and free of parasites when u make ur purchase) drag the mouse around 2 leave a scent trail and then leave!dont try 2 watch and sometimes the mouse may lay 4 longer than you are expecting—-leave it 4 at least 24 hrs.—GOOD LUCK! I first had my encounter with a 3 !/2 to 4 foot milk snake in the garden by the side of my house, I let it be and took some pictures and video just for fun. The next encounter scared the crap out of me. I was changing a fuse in the basement and lifted a discarded panel in my electrical panel and it was coiled up under it. I had work gloves on and tried to grab it’s tail to remove it but it was so fast. I think it got the hint and exited the way it came it because I haven’t seen it since. If my 15 year old daughter had seen it she would never come back in the house again. This thing was big compared to the usual garter snakes we have. LOL! Looks like a critter I came across last year on my riding mower! I thought it was a tree branch that had fallen from an old oak tree until I got a closer look. It was brown with yellow bands and about 3 foot long. Drew back into striking poise, but I swerved to miss it,then drove back to get my hoe. By the time I had gotten back to were it had been, it was long gone. I think it was just as scared as I was. I often wonder what kind of snake it was, now I know! So we have a hole in our house foundation that an adult milk snake comes and goes for the past few days. We have spotted a baby moving across our patio also. We don’t want it permanently in our house. 1. Should we plug the hole? 2. Would their den be inside our foundation? 3. How can we get them to go back down to our ravine and leave our house alone? I believe the hole allowed mice in over the winter and that was their initial draw. 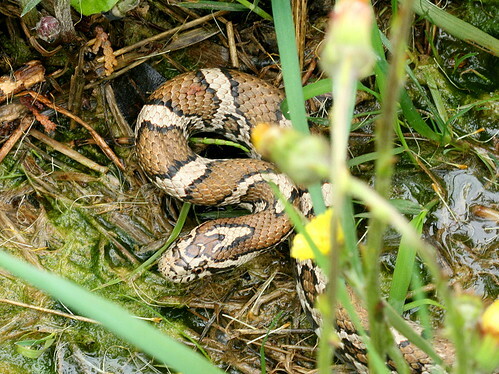 What brings milk snakes to your house. I’ve lived at my house for 2 years now and have never seen one. Now today I had one in my garage and another in the driveway within and hour. I don’t mind snakes but I don’t want them in my house. Hopefully someone can help me with why are they here and how can I get them to go back in the woods and stay there. Nice site– I found one of those milk snakes dead in the road, unfortunately (Pennsylvania). Your site was helpful in identifying it… thanks. I found one the other day at the bottom of one of my compost bins as I was removing the last of the compost for my garden. This website helped me to confirm what I saw. He/she mus have been close to 3 feet. Beautiful animal! As I watched him/her, he/she just slithered away. Just how do you tell th egender of a milk snake? Great info – thanks. Thanks for the excellent site. I found one today near the house and first thought it to be a copperhead. We are on the edge of its range and I have never seen one this far north. After careful capture, I noticed its lack of pits and round pupils. These are not copperhead eyes. Your site helped me confirm the fact that this was an Eastern Milksnake. This was the most aggressive snake that I have ever encountered. Had I not been wearing boots, my ankle would have been bitten. It struck at me repeatedly and did the little tail shake routine. Will go now and release it a little away from the house. Will also take a few photos but they will probably not be as good as yours. Thanks again for your excellent site. Thanks for your site. I saw this lil guy today in my central NJ garage. I think he is a Milksnake too! Was agressive at first, then went to sleep under some cardboard. Finely shoveled him out safely. Good a few good pics. I found a milksnake to day i think! I live near boston and I just found a milk snake inside my garage. there is no place for it now outside, so what should i feed it? (about 7 in long) please reply thanks! My local Paris Farmers Union (in Paris Maine) sells crickets. They feed them to lizards and things like that. Maybe your snake might like them? Milks like mice, that is why they are called milk snakes. They use to hang out in the milking barns to eat the rats and mice. You do not usually have to feed them live, you can purchase frozen rodents at most pet stores now. 7 inches is small so you would need baby mice, pinkies they are called. You can also order them online. It is important to feed them older mice when they are able to eat them as they need the calcium from the bones of the older ones. Baby mice are mostly cartilage. Make sure it has somewhere to hide, a soft substrate so he can burrow, and a constant supply of water. I would also consider a heat pad on one section so if he feels the need to warm up he can, but it is just as important that he is able to cool down so make sure it does not take up a huge section of his enclosure. Good luck, milks are my personal favorite pet snakes. I have an eastern milksnake in my composter. I saw it last year as well but dissappeared too quickly for me to get a good look at it. It is back and I have now seen it 2 or 3 times. I suspect it is getting ready to lay eggs. I find it very strange though that it is side by side with an equally large garter snake. I would think that which ever happens to hatch first would eat its bunk mates of the other species…but I am not sure. My nephews come regularly to see the snakes. I have seen up to 4 snakes in the composter at once but they are all garter snakes except for the one. There may be more below in the pile. Luckily I have another composter to use because I really don’t like snakes. What a pretty snake. We found one yesterday and she was perfect! I love milk snakes, I raised a couple of Mexican Milks L.T. annulata and I was very excited to see the Eastern here in CT I have only seen two wild ones. She was under a bunch of boards where the moles were living, she was obviously well fed! I held her for a while and she showed no interest in biting (doesn’t mean they won’t, I have just had good luck with this genus!) My husband came out and took some pictures and held her, we day-dreamed about keeping her in my old milk snake enclouser, but knew she was better off keeping her species going in the wild. I wished her well and let her go back into a different wood pile since we will be moving that before winter and I don’t want her to be too comfortable in a non-permanent micro-habitat. I also saw 2 garter snakes, one little guy and one big mama! Interestingly all three snakes were in shed. In fact the milk started shedding in my hands. I love snakes, so this was an exciting day for me! bye love you so much. Excellent article! You have a wonderful style of writing that is both informative and entertaining. The gorgeous pictures of this marvelous creature are an added bonus. I’m really enjoying your site and have added you to my blogroll. Cheers. We just saw a brown snake in our garden, and I think it’s an Eastern Milk Snake. It was fun seeing a snake! Hello! I sent you a “Contact” a few weeks back asking permission to use your photo of the Eastern Milk Snake in my blog. I saw a huge one last year in my front yard and just want people to see what it looked like, because I didn’t have my camera when I saw it! Of course! I’ll credit the photo to you if you are okay with it? I have seen many of the eastern milk snakes in my yard. And always a few times aa year in my garage!!!!! When playing with them they sometimes will role over and play dead. Then in a while they scurry off. Good day! Interesting site, many infomation, good decor,thanks. I download without coming off! Good day very nice wweb site!! Guy .. Beautiful ..
enormous post to incfrease my know-how.